How do I enter music with the mouse? Use cut (x), copy (c) and paste (v) to move or copy music from one location in the score to another. How do I select notes? How do I select a measure/range of measure? Click into an empty space within a measure. Its staff lines should be drawn in light-blue. If you hold down the shift key and you click into an empty space within different measure, a range of measures will now be selected and highlighted. When adding new notes they end up in the wrong measure. How do I go back to a previous measure? Select the measure you want to add the notes to and press “s” or choose “Make Current” from the Edit menu. You should now be able to add notes to the selected measure. When I open the editor and start entering music, I see strange characters instead of music glyphs. What gives? You probably have a non-installed font preselected. Choose Bravura in the MaxScore / LiveScore Preferences instead. What is the difference between a measure, a staff and a measure/staff? Think of measureand stavesas a two-dimensional matrix with stavesas the x axis and measuresas the y axis. A measurerefers to vertical content across all staves for a given measure number, whereas staffrefers to horizontal content across all measures for a given staff number. A measure/staffrefers to the cross-section between a given measureand staff. This is the smallest unit in the matrix, so to speak. What is the easiest way in MaxScore to set the tempo to something other than a quarter note? This is requires hiding MaxScore’s own tempo markings and creating “graphical” markings with the addRenderedMessageToMeasure message. You will find a demo of an abstraction that implements this functionality in the Cycling ’74/MaxScore Lib/Examples/mySetTempo folder. I tried to open a score, but all I see is an empty documentation window. 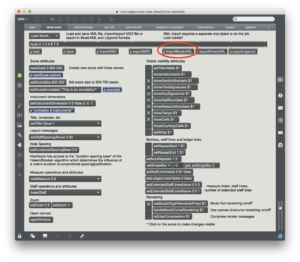 Don’t forget, MaxScore sits inside the Max/MSP environment with its own set of menus. What you have probably done is to try to open the score from the host not from within the MaxScore editor. Open the file from the editor’s own File menu (which, Windows-style, sits right under the title bar) by choosing Load Score. I tried to read a MusicXML score, but all I see are cryptic error messages in the Max console. MaxScore uses its own XML format which is not compatible with MusicXML. 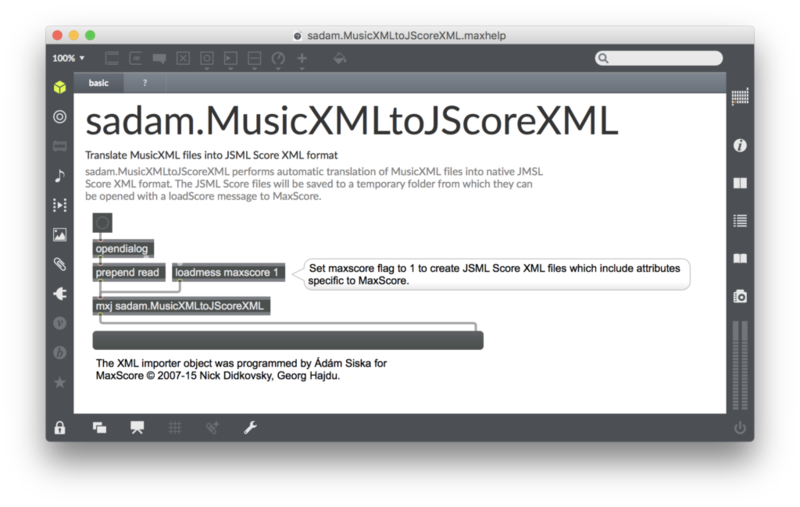 If you wish to import MusicXML files you’ll need to convert them first to native format with the sadam.MusicXMLtoJScoreXML object. Note that some features may be missing after conversion as the object doesn’t support the full MusicXML feature set. You may also want to refer to the help file. Or MaxScore Overview from the Max Extras menu. How do I create a standalone from my MaxScore patch in macOS? Copy the maps and microMaps folders from Max [your version]/packages/patchers into it. Create a folder named java in Content/support and copy the lib folder from Max [your version]/Cycling ’74/java into it. Remember to download and install the New Aloisen font (if not already installed) Run your application and verify in its Max window, whether or not other resources are missing. If so, add them to the support folder. Do I need Java to run MaxScore or LiveScore? Yes, definitely! MaxScore and and LiveScore use the API of the Java Music Specification Language. The Java Runtime Environment (JRE) must therefore be installed on your machine. mxj: could not find Java 2 Runtime Environment. (mxj) mxj_platform_init failed. Could not initialize the Java Runtime Environment. 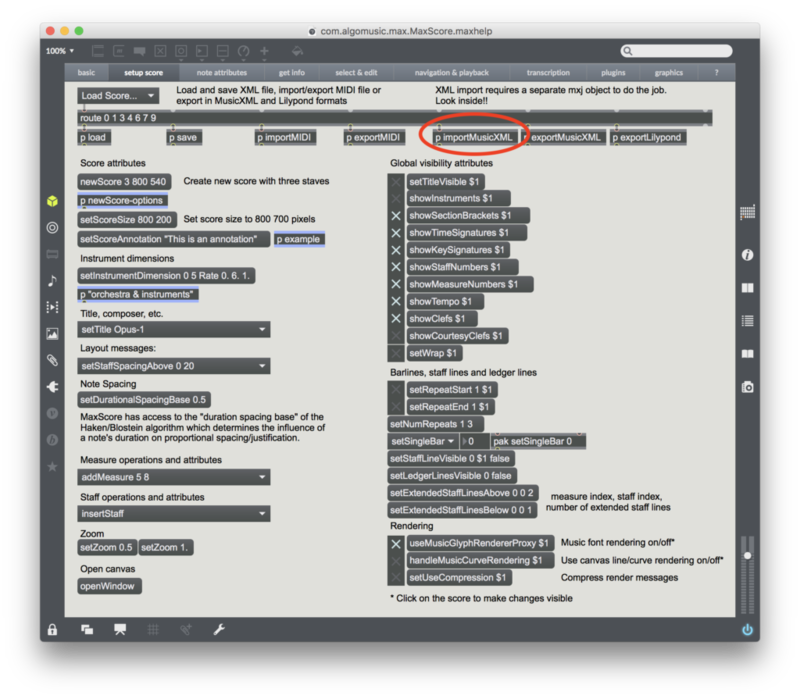 Max and Ableton Live come in two versions: 32-bit and 64-bit. Without going into the differences between the two versions, the button line is that when you run 64-bit Max and/or 64-bit Live, or 32-bit Max and/or 32-bit Live, resp., you need to have the matching JRE installed. But how on earth can I find out what software versions I’m running and whether I have the matching JRE? Max: Find the Max splash screen (About Max) and check the bit info that comes right after the version number, e.g. Version 6.1.7 (e5b6090) (32-bit). Ableton Live: The About Livesplash screen also states the bit info. Java: Windows users please refer to this page in order to find the matching JRE version:http://java.com/en/download/faq/java_win64bit.xml. If you have already edited a staff but want to record more music into the associated clip, we recommend you insert another, temporary, staff, assign it to the same clip, transcribe the music and copy the additional notes into the old staff. You can now safely remove the temporary staff. What happens if I add a new Live clip and want to transcribe it too? If you add a clip and you can’t find it in the Staff Manager’s Live Clip menu, click on the underlined “Live Clip:” label to update the menu. I have double clicked on a MIDI clip after selecting notes in the Viewer, switching to Clip View. When I return to the Device View, the notes are still selected but the keyboard seems to have lost its focus and I can no longer use key strokes to edit my score. How do I get the focus back? In the Viewer, click on the pane left to the notation canvas and move the mouse pointer back to canvas. Now, you should be able to use the keyboard again. When transferring a microtonal score from MaxScore to Sibelius (or Finale) via XML, will the microtonal notation (accidentals) stay as written? That is, will each note and accidental stay precisely the same? Not really, Finale can import and display quarter tones, but transposing and editing leads to unexpected results. According to reports found online, Sibelius is also able of importing quarter-tone notation. To my knowledge, the only notation editor capable of importing microtonal music in eighth-tone resolution is Noteability Pro. Yet, since MusicXML doesn’t specify the font and appearance of the microtonal accidentals to be used, there is no guarantee that they will end up looking like they did in MaxScore.